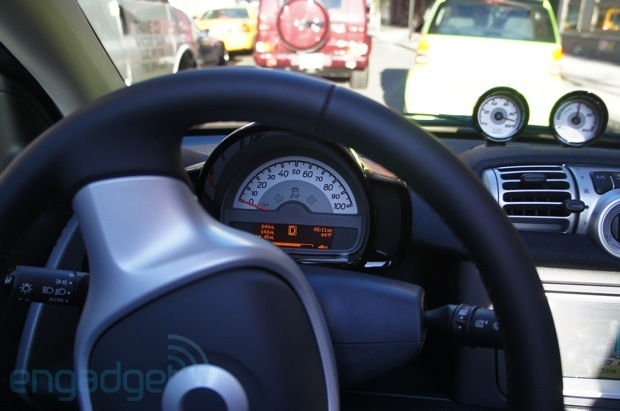 The eponymous "Smart car" has been buzzing around city streets in the US for over five years now. It's actually called the Fortwo, thanks to its limited seating capacity, and while it didn't prove to be an immediate hit, sales have been steadily increasing. An electric version of the car has been available in limited numbers overseas for years now, but finally this year it's coming to the US. And this is it. We got a chance to drive a green vinyl-wrapped Smart Electric Drive around some city streets ahead of the opening of the New York International Auto Show and came away reasonably impressed by this $25,000 EV -- the cheapest on the market. Join us after the break for our impressions. 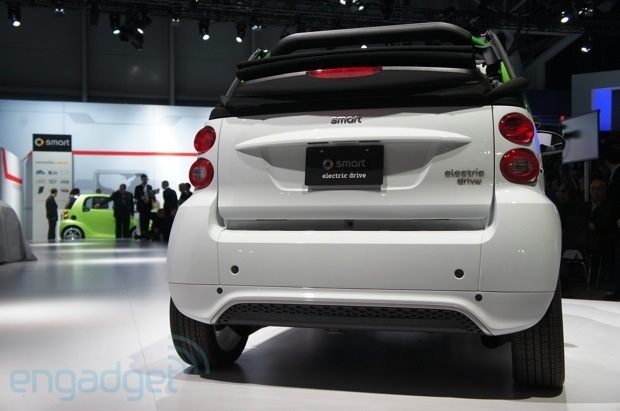 It's worth noting that the EV version of the Smart Fortwo has been available in Europe for a few years now, but Smart is only now seeing fit to ship it to the US. Thankfully, it's doing it in a big way. Starting this spring, the Smart Electric Drive will hit limited US dealers before spreading through the rest of the country through the summer, meaning regardless where you live you'll be able to buy one -- eventually. And, at $25,000 (not including the $7,500 tax credit), this is an EV your average driver can actually afford. That said, it's probably not offering enough range to be everyone's primary car. With just a 68 mile combined range you won't be able to do much road-tripping, but for running about in the city and short commutes it should be just fine. And, for those duties it's quite well suited. The car lacks the kind of power needed to be an overtaking master on the highway, it accelerates quickly away from a stop and has plenty of torque to make it a fun little thing to drive. That said, the driving experience wasn't all joy. The amount of regenerative braking, which slows the car and charges the battery when you lift off the gas, isn't adjustable like it is in the Chevy Volt or the Audi A3 e-tron. However, light application of the brake will temporarily boost regeneration. Push harder and you'll get a very unsatisfactory feel. The brake pedal is unusually stiff, like stepping on a block of wood, which does not equate to good feedback. It does, at least, stop well enough. Did we mention the size? The Smart Electric Drive is incredibly tiny, just like its Fortwo predecessor, which makes it ridiculously easy to park and make your way through the urban slalom without breaking a sweat. It's also available as a convertible, the only drop-top production EV in the US. If you're convinced, Smart will be happy to take your pre-order information now, but we'd recommend taking a long, hard look at your driving needs before signing anything. You can get up to about 75 miles if you drive carefully, but even that isn't far.